19.09.2013 - Batam. I Love Peanut Butter and so as my son. He loves Reese's Peanut butter cups too very much. 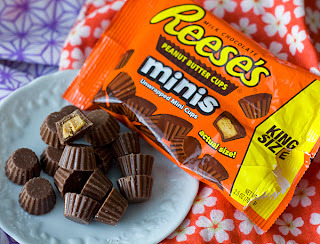 Today son has a special request after he watched Utube, he came up to me and asked me to make him Peanut Butter Cups a.k.a Reese's Peanut Butter Cups. I didn't reject him, well i say ok! because recently i've got the recipe. so i get the recipe ready and to the kitchen do my stuff. As i always don't have a complete things needed for the recipe as such in a hurry. so instead of using silicon cups or paper miniature cups. 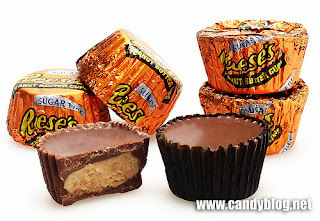 I used ice cubes mould to fill the peanut butter chocolate or whatever i could think of! at least that could hold them together. And as always, i don't follow the exact amount of measurement used in the recipe......( thats me...) i always come out my own idea and measurement to use what i have....and no exact measurement again. Just hoping it will be right. Overall, came out so well. and so easy to make. I just love it!! and my son too. 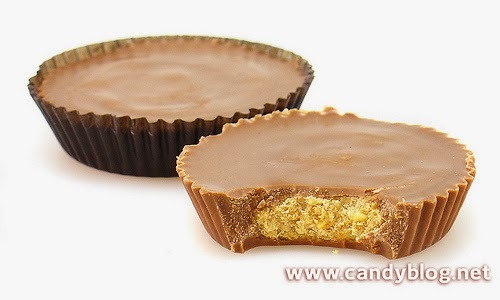 The Peanut butter cups aren't hard to chew or bite, its not over freeze, its not over sweet, the harden of the whole peanut butter cup just at the right temperature. can easily scoop with a teaspoon. like what my son did in the pic below. Below recipe is my own recipe that i have already modified. And the pic finished result you see it was a success. Yummy! Anyone who doesn't love sweets or chocolate might not knowing how does Reese's Peanut Butter Cup look like, here are some picture for you. and that is what im making. Scoop 2tbsp full ( mean really a spoonfull ) of peanut butter, salt, butter, and confectioners’ sugar. And stir and mix well, gently press the butter if your butter is hard and put it in a plate of hot water to make it softened and continue stirring until everything is well mixed. Prepare a double boil, add peanut butter in the chocolate and melt or in the microwave oven. And stir until smooth. 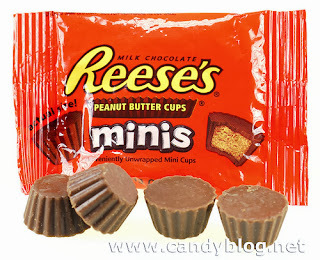 Drop a teaspoonful of chocolate mixture in each mould / silicon miniature or paper miniature cups. Drop teaspoonful of peanut butter over the top of the chocolate layer. Let cool for 10 minutes in the refrigerator. And finally top with teaspoonful of chocolate mixture. Let completely cool in the refrigerator.